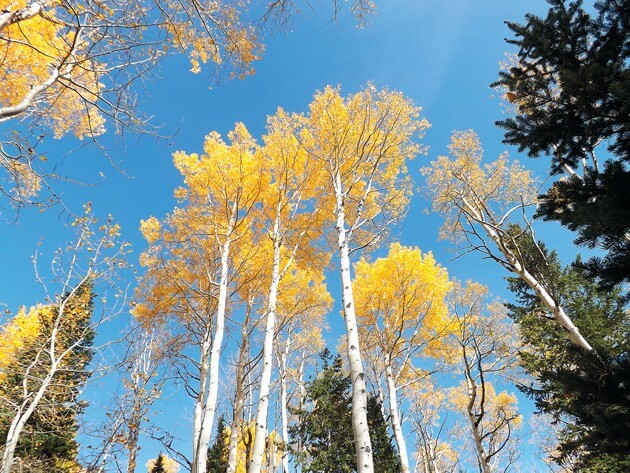 Golden aspen trees stand outlined by blue sky along the Deseret Peak Trail in Mill Fork. Autumn is my favorite season. I love to explore hidden pockets of golden splendor in the mountains where the aspen burn like tiny embers. In Tooele County, one of the best places to see this spectacle also provides delightful mountain scenes and hiking opportunities. This area is found at the Loop Campground Trailhead at the end of the road in South Willow Canyon. 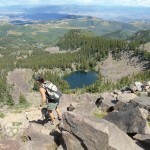 This trailhead is the most common start point for hikes to the summit of Deseret Peak and to South Willow Lake. To get there, follow SR-138 west through Grantsville and then on the west side of town turn left on West Street, which is also known locally as the Mormon Trail Road. Proceed south for five miles and turn right onto South Willow Canyon Road. Continue west for eight miles to the Loop Campground. At the west end of the “Loop” is a trailhead for Deseret Peak with vault toilets and parking spaces. Take a lot of water because in late autumn the creek is usually dry. There are many options from this point. After a few steps on the trail, a sign appears on the right that marks the boundary of Deseret Peak Wilderness Area. This 25,000-acre preserve was established as part of Public Law 98-428 “The Utah Wilderness Act 1984.” The act concluded that Deseret Peak and other areas in Utah possess outstanding natural characteristics that give them high values as wilderness and if properly preserved, will be an enduring resource of wilderness for the American people. The trail heads west through a large stand of aspen and then makes a long switchback up to a major creek crossing that is dry by this time of year. Just beyond the creek is a signed trail junction. 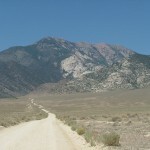 Turn left for Mill Fork, which is the most usual approach to the summit of 11,031-foot-high Deseret Peak. Turn right to climb Dry Lake Fork and on to South Willow Lake. If you go there this weekend, I recommend following the South Willow Lake Trail. The large stands of aspen you will pass through at the head of South Willow Canyon will be at peak colors. On my hike last weekend, I followed the Mill Fork Trail. I joined a friend who wanted to bag Deseret Peak. We met at Maverick in Grantsville at 4:30 a.m. and were at the Loop Campground Trailhead and on the trail by 5:30 a.m. It was dark and cold. The stars looked like crystals in the frozen sky. The wind was calm and all was silent in the woods as we trudged along through the dark. Because it was dark, I couldn’t see the color on the trees, but I could smell the cool damp of autumn in the air. The Mill Fork Trail was set by William Eimbeck’s survey team in the employ of the U.S. Coast and Geodetic Survey during the Triangulation of the 39th Parallel of the United States back in the late 1880s. In his reports, Eimbeck talked about getting supplies in Grantsville and then building a trail to the summit of Mount Deseret in order to establish what he referred to as the central triangulation station of the great quadrilateral. Eimbeck and his crews transported all their tentage and equipment on mules to the top of Deseret Peak, where they established a circular station with rock walls 2.5 feet thick and 5 feet tall with a wood plank floor covered by a Sibley tent. From this station, they conducted azimuth, distance, position and elevation measurements using heliographs, theodolites, and star pair observations. These works were instrumental in determining elevation, correct position for mapping and distance in those times. Over the years, this activity has faded from the memory of most people who follow these trails, but it is something to think about as you trudge along the trail. After a steep series of switchbacks at the head of Mill Fork, my friend and I topped the rim just as the sun was rising. This rim is 10,042 feet high and is the boundary between the forest and the tundra above the treeline. Gnarled limber pine — and in places, bristlecone pine — are twisted grotesquely in the direction of the prevailing winds here. Engelman spruce and sub-alpine fir are reduced to ground-hugging mats of wind timber only a foot or two high. At this rim you reach a trail junction. If you turn right, you will climb above the trees another 1,000 feet to the summit of Deseret Peak. If you head straight, you will drop several hundred feet and around the bend of the mountain to the west into a beautiful hanging mountain valley at the head of Antelope Canyon. Another ancient trail that you may or may not be able to follow heads east along the top of the rim, where it is well defined, and then skirts the west face of Hickman Peak, drops to a pass and descends into Bear Fork of Hickman Canyon. My friend was satisfied with his accomplishment at the rim and, feeling the effects of altitude, he decided to hang out there and relax. 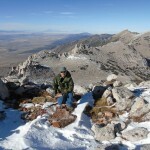 I have climbed Deseret Peak over a dozen times, so I turned my attention to a sub peak to the east. This peak rises abruptly above Hickman and Box Elder canyons to an elevation of 10,230 feet. I explored the rim and noticed some secluded primitive campsites in the trees on the edge of the rim that provided stunning views of the Stansbury Mountains to the north. After that, I followed the ridgeline south to all the summits of this mountain I refer to as Hickman Peak. A fire devastated this ridge not long ago, and the charred skeletons of ancient trees stand stark against the sky here. Powdery gray ash and jet-black charcoal litter the ground, but grass and alpine plants are beginning to make a comeback. The geology along the ridge is interesting as gray limestone cap rocks are streaked with tan bands and orange lichens. 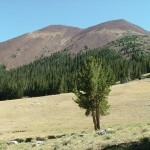 The giant bulk of Deseret Peak looms to the west. I linked back up with my friend and we quickly descended Mill Fork. It was full morning now and sunlight lit a forest of aspen in the bottom of the fork. The trail and forest floor among the white trunks were littered with golden leaves. The light in the forest changed to a strange yellow hue, due to the color of the canopy and blue sky. After taking hundreds of pictures, I reached my vehicle at 12:30 p.m. and then headed east toward the Uinta Mountains for another hike that day. This weekend offers another chance to see the colors in the Stansbury Mountains. Get out there and take advantage of it if you can. You will be rewarded with a magnificent autumn mountain scene. Take plenty of water and look over the USGS 7.5 min. 1:24000 Deseret Peak East and Deseret Peak West quads before you go. Apply sunscreen and ensure that you wear “Hunter’s Orange” out in the mountains this time of year.